The Cheetah Girls by Umgd/Disney at WA Tunes. MPN: MFR050086012671#VG. Hurry! Limited time offer. Offer valid only while supplies last. Meet the Cheetah Girls: four New York teens facing the challenges of growing up as they dance and sing their way toward that elusive record deal. Meet the Cheetah Girls: four New York teens facing the challenges of growing up as they dance and sing their way toward that elusive record deal. Raven (That's So Raven) stars alongside Adrienne Bailon and Kiely Williams, and Sabrina Bryan (The Bold and the Beautiful). As the girls are gearing up to rehearse for the school talent competition, they're discovered by famous record producer Jackal Johnson. But the feisty foursome soon learns that their big break is not what they expected. Jackal wants to remake them into something they're not. Ultimately, the path to stardom challenges their friendship and the girls must find a way to come together in order to achieve their dreams. 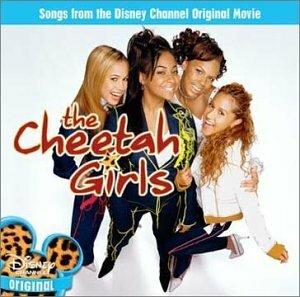 Packed with hot songs and cool moves, these darling divas steal the show in this hit Disney Channel movie. If you have any questions about this product by Umgd/Disney, contact us by completing and submitting the form below. If you are looking for a specif part number, please include it with your message.